Action Alert - Protect Bike Access Now! The State Assembly Committee on Natural Resources recently passed a bill that directs the State to assess the suitability of numerous state lands in Northern California for Wilderness designations. Mountain biking is an existing use in several of these areas, including Robert Louis Stevenson State Park and Henry W. Coe State Park. 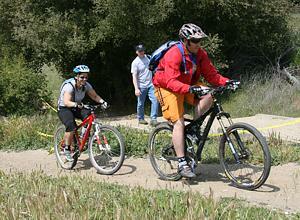 Mountain bikers also have a long-standing proposal to create shared-use trails in Austin Creek Redwoods State Park. Because Wilderness designations would prohibit bike access in these parks, we urge that these areas should be protected through other means. IMBA California Policy Advisor Tom Ward has testified in front of the committee and many members expressed their support for mountain biking - but they still passed the bill out of committee. Unless they hear from the mountain bike community, the bill will keep moving and suggest massive closures at three important parks. There are many ways to protect these important places without banning the existing use of mountain bicycling. Cyclists need to rally and make sure their assembly member hears from our constituency. Take Action! 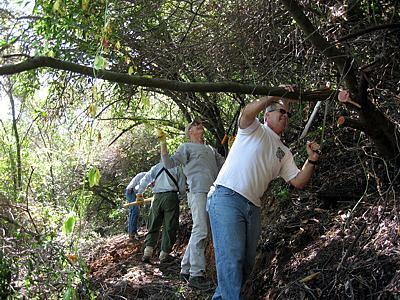 We will be working on the Rim of the Valley Trail in Duekmejian Wilderness Park in the City of Glendale. This is a very scenic trail that starts in the park and runs to the Mount Lukins fire road. There is approximately one mile of trail that is in need of brush and tread work. We will also be taking some time to do some training on proper trail maintenance techniques. For full details, see the CORBA Calendar. Novice (C level ride) A great ride for first timers to SBMBC. One of the easiest and most beautiful rides near Los Angeles! We will ride up Sycamore Canyon and take the Two Foxes Trail. This will be an eight-mile round trip ride on fairly level ground with one creek crossing, some single track and fire road. The leader will go over the basics of how to ride a mountain bike as we enjoy following the river trail into Sycamore Canyon. If everyone agrees, we can add or subtract from the standard ride, and for example, go up Guadalasca to Overlook and back down to the start. For more information on C-rides, check the SBMBC website. Intermediate (B Level ride). This ride will start in the Hahamonga Watershed County Park, formerly known as Oak Grove Park, home of best disc golf course in the west. We will cross the park and ride up the Brown Mtn. fire road to the Ken Burton Trail. We descend this steep single track into the Arroyo to the Gabrielino Trail. This ride does involve water crossings and some hike-a-bike. Approx. distance 15 miles. Option to do another lap up Brown and down El Prieto adds about 6 miles. BBQ afterwards in the park. Bring something to grill. Side dish, chips and dip, condiments and drinks will be provided. RSVP for lunch, see the SBMBC website for info. For other rides throughout the month, please visit www.sbmbc.com. Saturday July 5 is the next skills clinic. Save on your next cell phone when you buy it from PhonesForGood.com. Visit our Phones For Good news article for details.